Here's what I call my hosta farm. I grew a patch of 3-4 varieties here, and then I can grab one and divide it any time I need to fill in a spot somewhere on the property. Very handy, especially with the price they're charging for just starts. PL, what a great idea! I think I will do the same. They are such an amenable plant--easy going, easy to plug in here or there. I like the idea of "stockpiling" some, for later use. Very nice PL! 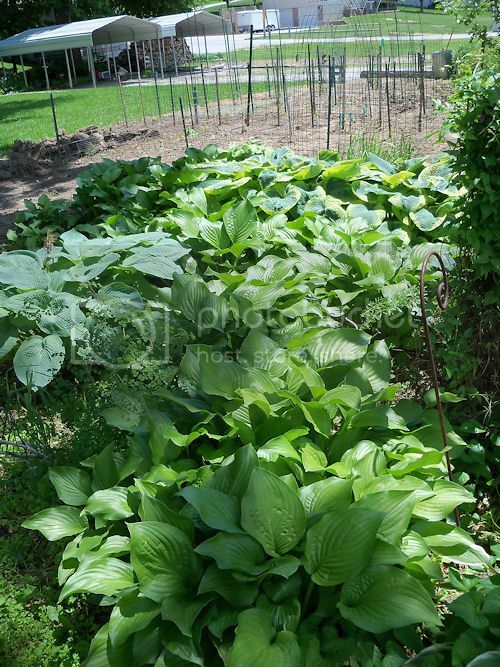 That's a lot of Hostas! Oh Yes, that is awesome. The price of hostas over here prohibits me from buying many. What a terrific idea to 'farm' your own!! How do you manage to keep that amount of plants slug free though? They are all so healthy with no damage that I can see on any of the leaves. Mine look like lace they have so many holes in them. I've been lucky, we've never had slugs here. Great idea! I have some HUGE Hosta's that I occasionally split and re-pot to sell. This gives me $$ to buy new Hosta's! You are right Eileen, new varieties are getting VERY expensive!